An indoor garden may include something as simple as plants on a shelf to an entire living wall, such as the three-story indoor vertical garden of an office building in Elche, Spain, or the living wall in Edmonton International Airport in Alberta, Canada. Whether in a residential or commercial space, plants in an indoor garden such as bamboo, Chinese evergreen, English ivy, peace lily, philodendron, and the spider plant, can help to filter out indoor pollutants commonly found in home and office produced by office equipment and appliances. These pollutants may cause "sick building syndrome," a condition that causes headaches and respiratory problems due to unhealthy or stressful factors in indoor spaces, such as poor ventilation. What makes an indoor garden unique is the ability to properly control the environment, such as the air temperature. Temperature is important for plants to now only grow, but it also affects the growth of pests, fungi, molds, mildews, and bacteria. Having the right temperature during the day and night are important. The ideal temperature for an indoor garden during the day is anywhere from 65°F to 75°F for most plants, and the temperature at night should drop no more than 15°F from that of the daytime temperature. If it's not ideal to heat an indoor environment to such warm temperatures, a solution is to use soil heat mats, which can regulate the soil temperature that is ideal for plants instead of the entire indoor space. Plants also need adequate humidity, which can be resolved by having a humidifier to increase the moisture content, misting plants regularly, filling a tray with water and placing it near the garden for evaporation, or by placing plants closer together to increase humidity. A climate controller is a device that can automate not only humidity but temperature and CO2 as well. Some climate controllers have a notification system for environmental condition errors, independent day/night temperature settings, and can record min/max CO2, humidity, and temperature. Plants need adequate light, at least 10 to 18 hours of depending on the type of plant, to survive. Not enough sunlight causes leaves to fall, or not to grow at all. Therefore, it's important to properly design an indoor garden in the ideal location depending on the plants' needs. A garden designed by southern-facing windows will receive the most light. Plants that need moderate sunlight or morning sunlight only benefit from east-facing windows. Full afternoon and evening sunlight comes in through west-facing windows. To help with light when planting in these indoor locations is not possible, an artificial light source, such as an incandescent or fluorescent grow light is helpful. A fluorescent light is commonly the best artificial light source for indoor plants because it is cost effective and stimulates plant growth. The size of the light depends on the size of the indoor garden. The proper distance of the light from the plants and the proper amount of light is an important consideration as well. Water frequency is another factor that can be controlled with indoor gardens. Depending on the plants, some types need to be wet or moist at all times, moist/dry or dry. One way of controlling watering needs, which is vital to all plants, is through a drip irrigation system. Installing a drip system includes running a soak hose system along and around plants that connect to a water pump and hydroponic reservoir or water storage tank. A filter should also be used to collect sediments in order to prevent clogging. A drip system can return run-off water to the soil, and installing one that runs on a timer can automatically turn water on and off when needed. 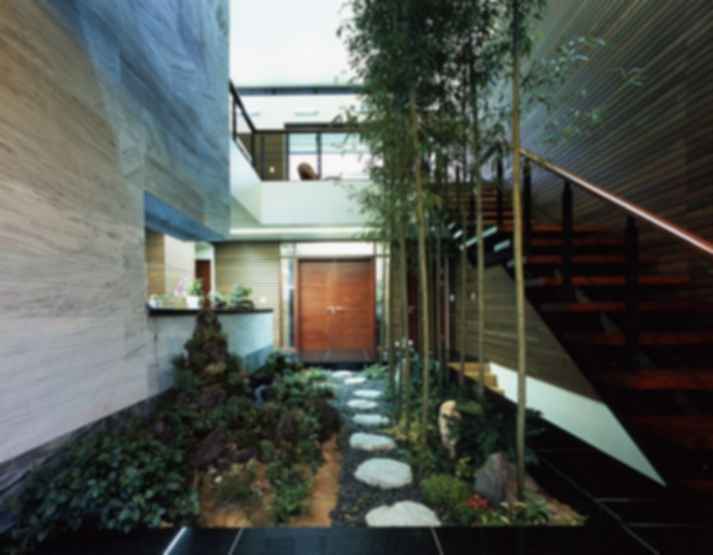 What are some challenges of integrating an indoor garden into a building design? Another thing to consider is the plant response from a lamp. There are different kinds of lamps with associated plant responses. Such example would be a high intensity discharge deluxe mercury (HG) or metal halide (MH) lamp contributing to the slow elongation of stems, development of multiple side shoots, expansion of green foliage and flowering over a long period of time.